Consuming too much preservatives, additives, food coloring , and artificial sweetener. Consuming unhealthy cooking oil. As much as possible reduce cooking oil use when frying, which includes even the best cooking oils like olive oil. Do not consume fried foods when you are tired, except if the body is very fit. 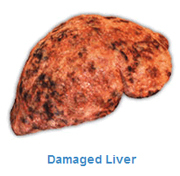 Consuming raw (overly done) Foods also add to the burden of liver. Veggies should be eaten raw or cooked 3-5 parts. Fried veggies should be finished in one sitting, do not store. We should prevent this without necessarily spending more. We just have to adopt a good daily lifestyle and eating habits. Maintaining good eating habits and time condition are very important for our bodies to absorb and get rid of unnecessary chemicals according to "schedule." Evening at 9 - 11 PM : is the time for eliminating unnecessary/ toxic chemicals (detoxification) from the antibody system (lymph nodes). This time duration should be spent by relaxing or listening to music. If during this time a housewife is still in an unrelaxed state such as washing the dishes or monitoring children doing their homework, this will have a negative impact on health. 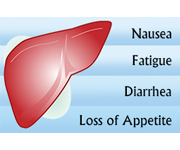 Evening at 11pm - 1 am : is the detoxification process in the liver, and ideally should be done in a deep sleep state. Early morning 1 - 3 am : detoxification process in the gall, also ideally done in a deep sleep state. Early morning 3 - 5 am : detoxification in the lungs. Therefore there will sometimes be a severe cough for cough sufferers during this time. Since the detoxification process had reached the respiratory tract, there is no need to take cough medicine so as not to interfere with toxin removal process. Morning 7 - 9 am : absorption of nutrients in the small intestine, you should be having breakfast at this time. Breakfast should be earlier, before 6:30 am , for those who are sick. Breakfast before 7:30 am is very beneficial to those wanting to stay fit. Those who always skip breakfast, they should change their habits, and it is still better to eat breakfast late until 9 - 10 am rather than no meal at all. Sleeping so late and waking up too late will disrupt the process of removing unnecessary chemicals. Aside from that, midnight to 4:00 am is the time when the bone marrow produces blood. Therefore, have a good sleep and don't sleep late.